The Fort Rucker Thrift Shop is a registered 501c3 non-profit organization operating on Fort Rucker. 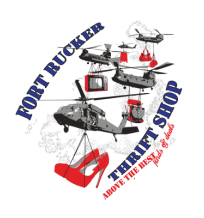 The Fort Rucker Thrift Shop donates all profits made to local organizations through the sale of donated, resale, and consigned merchandise. We are completely dependent on the support and generosity of our wonderful donors and volunteers, who enable us to continue to give back to the Greater Fort Rucker Area! Hours of Operation: Wednesday, Thursday, & Friday 10 am - 2 pm.